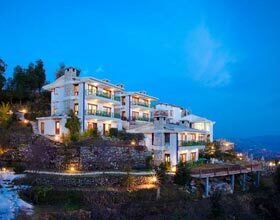 Royal Orchid Fort Resort Mussoorie is a boutique resort cradled amidst the lush greens on the illustrious Tara Estate on Picture Palace Road. Conserving the surrounding nature, this luxury resort built like a fort is an ode to contemporary architecture. 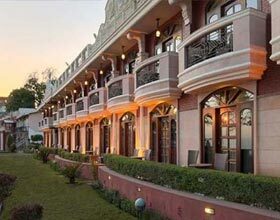 Fort Resort Mussoorie boasts of the amiable hospitality, immaculate services and flawless staff giving royal episodes of living to the guests during their abode. Enchanting the glory of this splendid resort are two banquets, namely Summer Hall and Winter Hall, ideal for hosting sumptuous weddings and social gatherings. They are also equipped with audio-video equipments to facilitate successful organization of business conventions. Jacuzzi, fitness center, outdoor excursions, indoor recreation activities are among the few perks enjoyed by guests during their stay in Royal Orchid Fort Resort Mussoorie. Paid internet access and transfer facilities are also available. 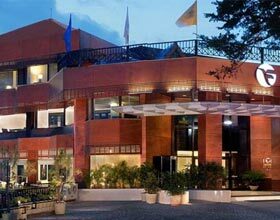 The elegantly designed vibrant accommodations at Royal Orchid Fort Resort Mussoorie are equipped with contemporary equipments including espresso makers and electronic safe. Teak flooring and regal-style furniture including 2 posterior king size beds are adored by guests during their stay in this luxurious resort. The 58 guest rooms and suites are subtly classified into Deluxe Rooms, Executive Rooms, Premium Rooms with/without Terrace, Duplex suites, One Bedroom Suites and Two Bedroom Suites. Landscapes and awe-inspiring sights of lush garden or majestic Himalayas offered by these rooms are breathtaking. Guests have gastronomical delight during their dining encounter at on-site restaurant of Royal Orchid Fort Resort, Mussoorie. Savor the delectable cuisines from around the globe fares in the classically tinged restaurant 62 Cover Pinxx, offering serene vistas from large bay windows. Relish the tranquil episode of dining on the terrace opening up from this fine dining venue surrounded by calm cool breeze and panoramic views. Please your late night cravings by the finger licking options from a la carte menu of this 24 hour restaurant.